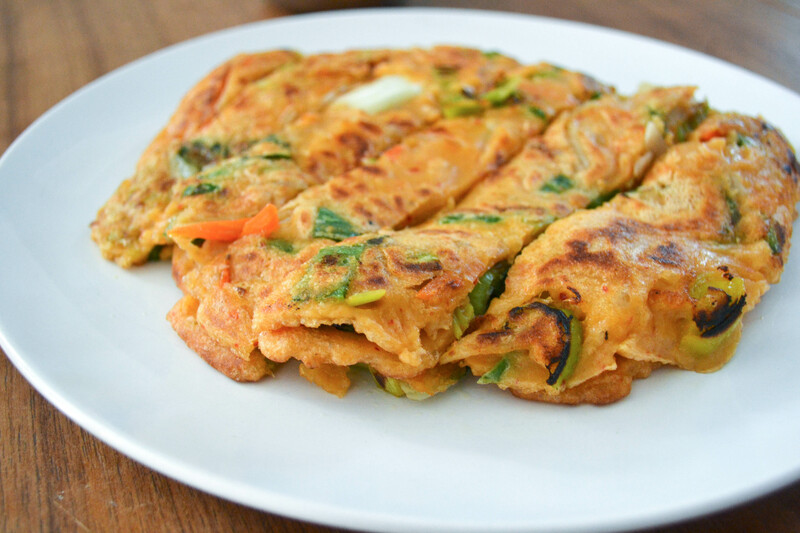 I made these as part of a larger Korean meal last night and they were so delicious that I made them again for breakfast. 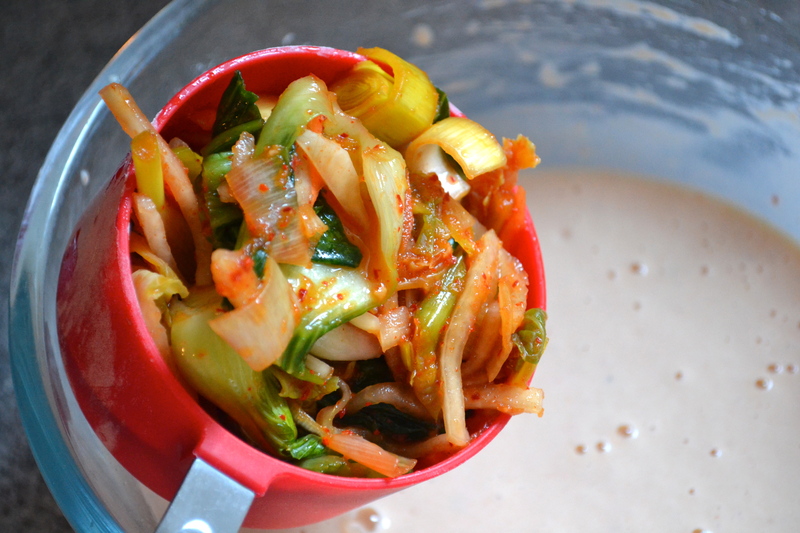 And—hallelujah—I have been using my own homemade kim chi! The kim chi making post is for another day though. 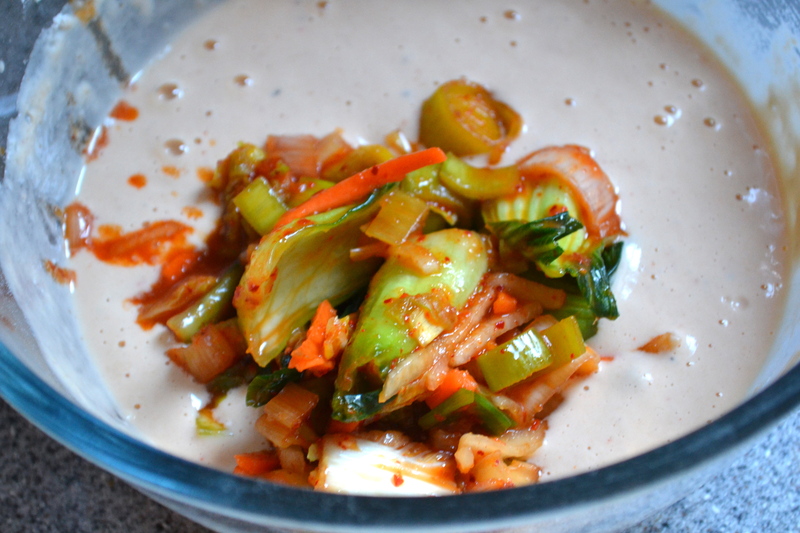 The fun thing about Korean food for vegetarians is the pretty much endless vegetable side dishes that altogether comprise a wondrous feast. Last night along with the kim chi pancakes and dipping sauce, we had sticky rice, fried tofu, kim chi, bean sprouts with minced garlic and sesame oil, marinated khaenip leaves and of course go ju chang and soy sauce. On other occasions we’ve had mandu, ramen, Korean sushi, jap chae, Korean style spinach, carrots, mushrooms… It’s so heartening to see a big table laid out with a multitude of small bowls of tasty goodness; kind of like tapas or dim sum. 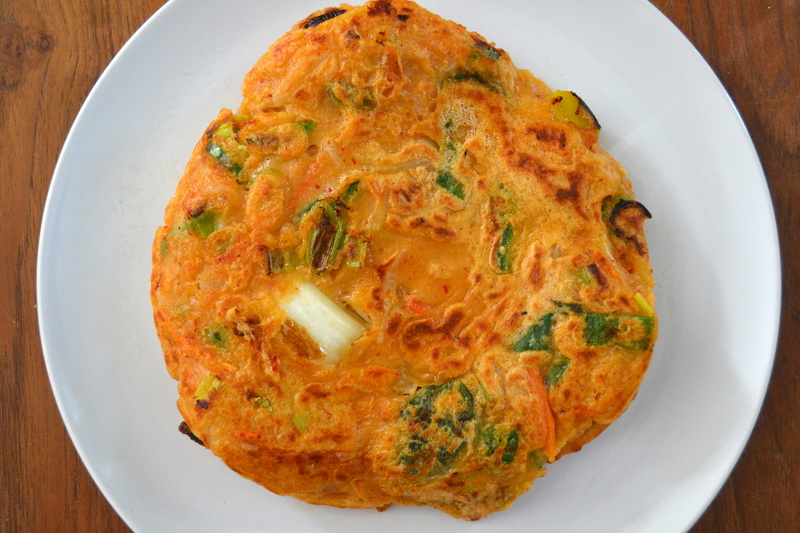 To this simple, basic batter can be added all kinds of vegetables such as spring onion, carrots, zucchini, chilies (and yes, even shrimp and other seafoods). 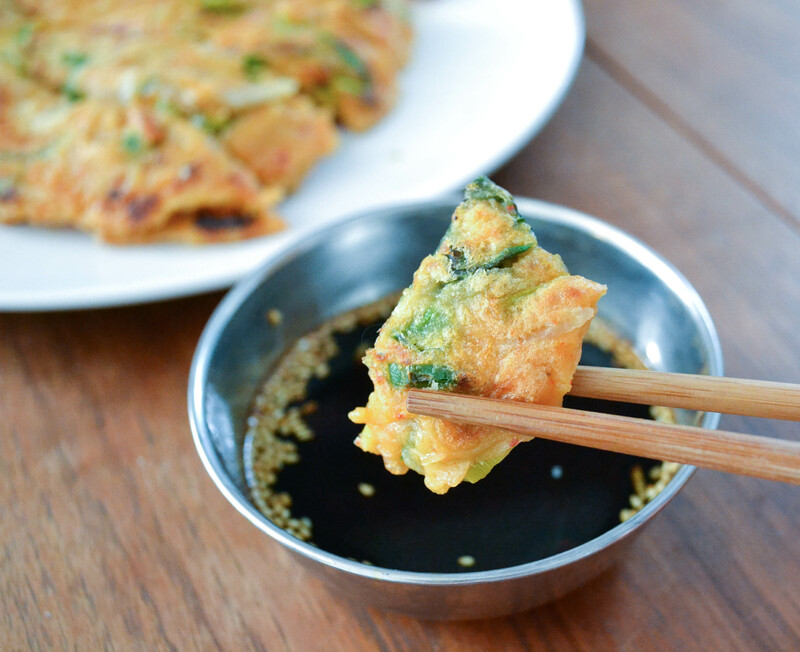 These green onion and jalapeño pancakes are worth a try too. 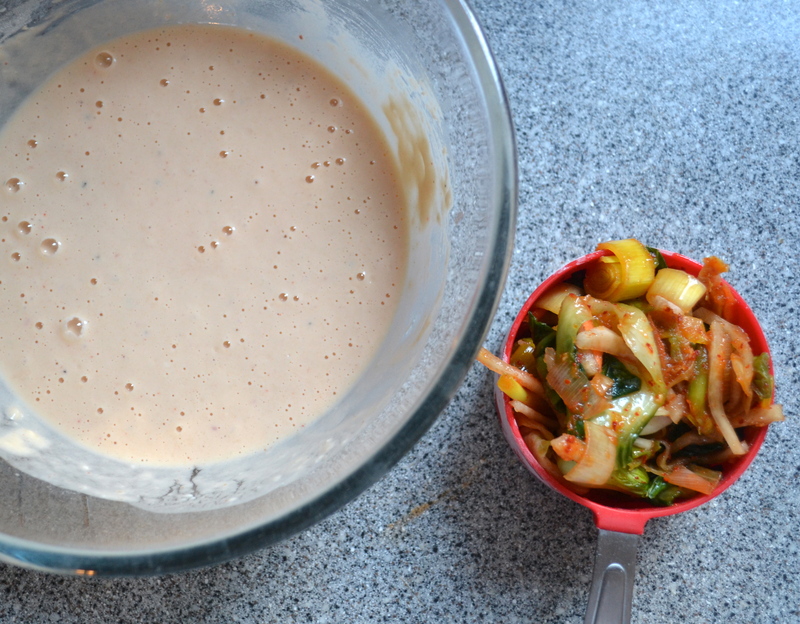 1) Mix the flour and water and kim chi liquid together. Add the egg if you like. I have tried with or without and the egg helps a little with the binding but it tastes good regardless. 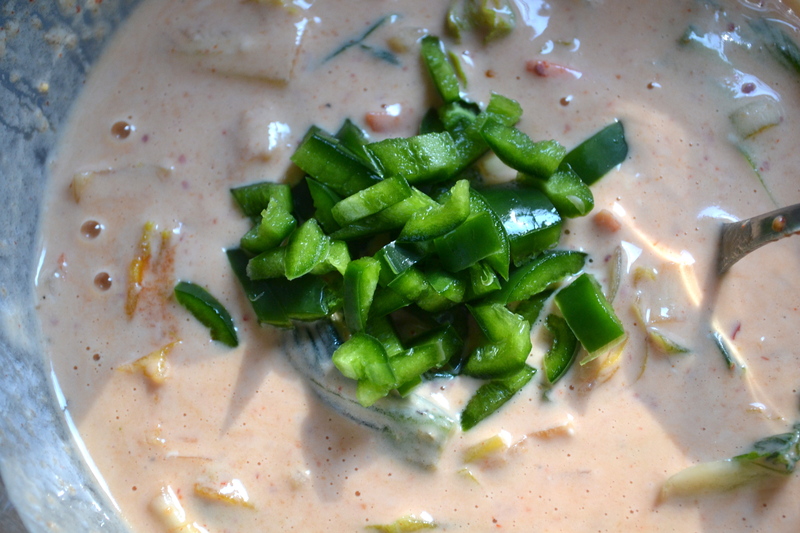 2) Add a heaping cup of kim chi, the chilies and green onion and a good dash of salt. Mix together. 3) Heat up plenty of oil in a large frying pan for shallow frying smaller batches (or use a smaller frying pan for making larger pancakes as below). You need enough oil for the pancakes to be crispy. 4) Ladle batter for frying several pancakes. Fry on one side about 4 minutes on med-high heat or until crispy and brown. Flip and cook the other side another few minutes until brown and crispy. Drain on kitchen towel before slicing and serving. 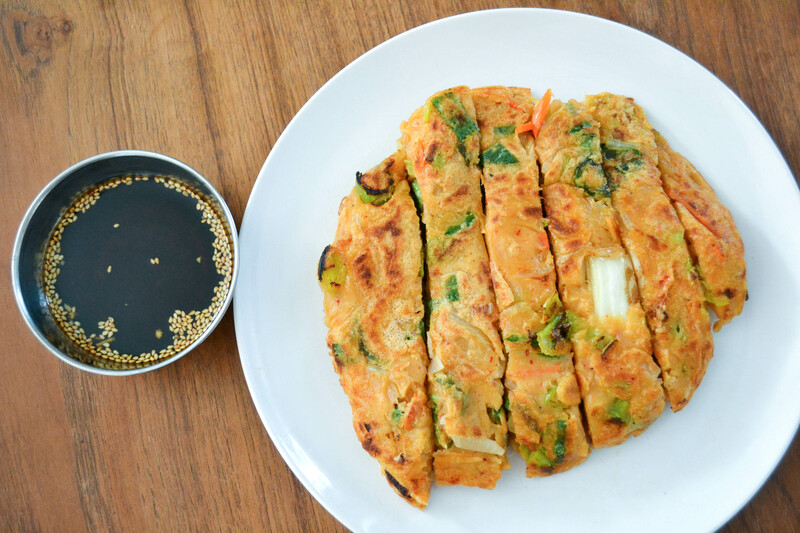 5) Mix the dipping sauce together and enjoy these pancakes cold or hot. Cut the pancake into triangles or strips and let people serve themselves. 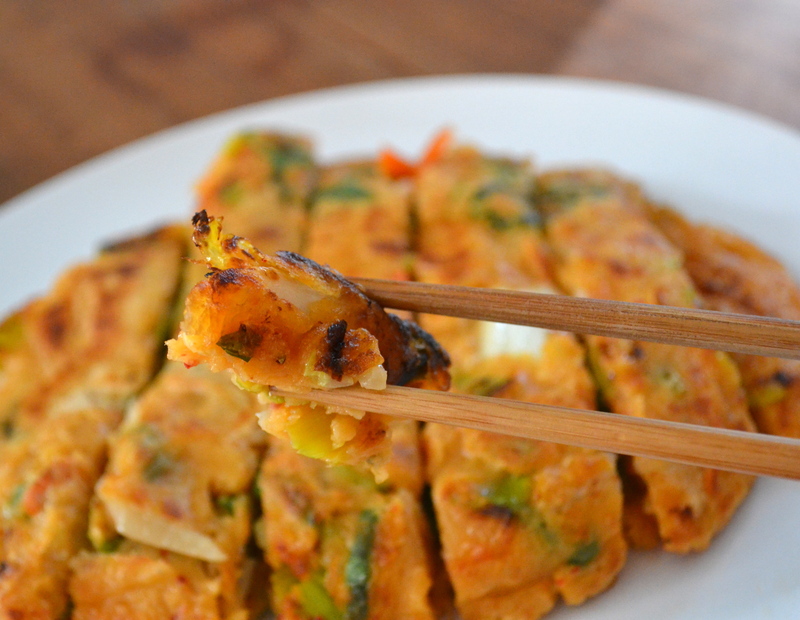 I’m loving Korean food right now – eating Gochujang on everything! These look delicious! Wow! Looks great. Impressed re. the kim chi making! I think I would get addicted to that stuff if I made it myself. How much oil do you think you used in terms of tablespoons to cook the pancakes? Thanks! I use American measurements and a tbs is about 15ml if that helps! Excellent! Thank you for the recipe, I look forward to trying it.